A small display providing information on our recent research on the male line descendants of King Robert II (1316-1390) was available to view at this recent and very successful Conference. Materials featured can be seen here. Following the Conference a gathering of Robert II descendants was held, at which seven descendants met up. The descent of six of these had been established as a result of DNA testing associated with our research. The results of the Big Y test for a documented male line descendant of Sir John Stewart of Blackhall & Ardgowan, d. c.1412, an illegitimate son of King Robert III, have now been received and analysed. Alex Williamson, author of The Big Tree http://www.ytree.net/ has identified a new SNP carried by this individual, which has been given the name ZZ52. Our two other Big Y test results, that is one for Earl Castle Stewart, a descendant of Robert Stewart, Duke of Albany, and the other for a documented descendant of Sir John Stewart, Sheriff of Bute, do not carry this SNP. Robert Stewart, Duke of Albany, and Sir John Stewart, Sheriff of Bute are both brothers of King Robert III. This means that ZZ52 must have occurred in Robert III or one of his male line descendants. In other words, ZZ52 is a distinct marker identifying descendants of Robert III. He may also have descendants who do not carry this, since the generation in which the mutation took place is not yet known. We have now verified the descent of one of those who has tested positive for Y14197, a distinct marker for the Bute line of Stewarts. This descent goes back to William Stewart in Kildavanan, Bute, who was married before 1692, when a daughter was baptised. It is likely that he was born around 1665 and therefore his father was probably born around 1640. From this evidence, we can now conclude that Y14197 occurred between around 1360, the approximate date of birth of Sir John Stewart, Sheriff of Bute, and 1640. Funding has now been received for the Big Y test on the sample from the male line descendant of Sir John Stewart of Blackhall and Ardgowan. We have now received test results for a documented male line descendant of Sir John Stewart of Blackhall and Ardgowan, d ca1412, an illegitimate son of King Robert III. This means we now have results for a descendant of each of three sons of King Robert II (1316-1390) – Robert III; Robert, Duke of Albany; and Sir John Stewart, Sheriff of Bute. Advanced testing (Big Y test from Family Tree DNA) has been done on two of these, which has helped to identify distinct SNP markers for the Bute line, but it is now important to carry out this test on the new sample. This could potentially lead to the discovery of distinct SNPs for the line of Robert III. In practice, that could, in the future, allow individuals to take a SNP test, to show that they are descended in the male line from Robert III. At present, we do not have funding for this test to be done, so would very much welcome donations, small or large which would allow this work to progress. The current cost of the Big Y test is $575 (around £400). We are currently researching male line descents from the Stewart, Berkeley and Grey families and are seeking funds to allow further DNA testing. The initial test results for a documented male line descendant of Sir John Stewart, Sheriff of Bute, a son of King Robert II, have been upgraded by carrying out a Big Y test, which has allowed comparison with the Big Y results for Earl Castle Stewart. 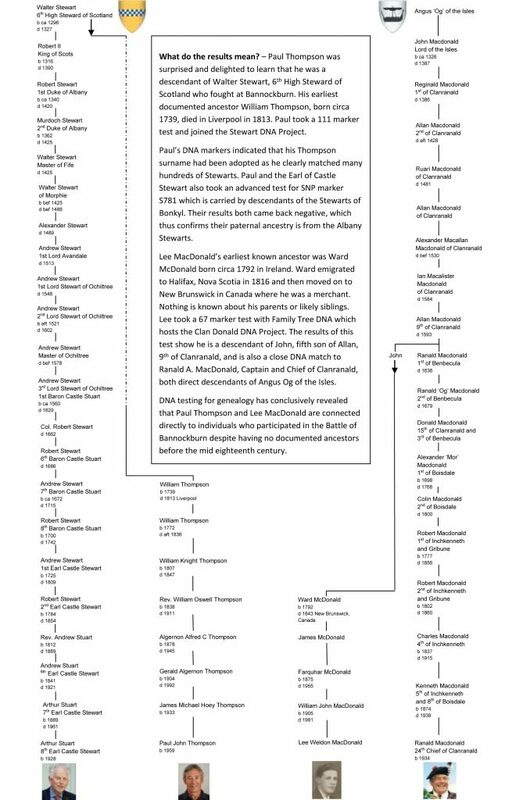 This has shown up distinct genetic markers which identify descendants of Sir John Stewart. The most recent Stewart test results (described above) now also need upgrading to the Big Y. If you would like to make a donation towards our genetic genealogy research, this can be done through the University of Strathclyde’s Online shop at http://onlineshop.strath.ac.uk/browse/extra_info.asp?compid=1&modid=1&deptid=156&catid=226&prodid=1314 It is possible to specify which aspect of the research you would like to donate to. If you would like to make a donation specifically towards testing with Family Tree DNA, this can be done at http://www.familytreedna.com/group-general-fund-contribution.aspx?g=StrathclydeCertifica and selecting PG Programme in the drop-down list. You can specify whether your donation is to be used for testing on one of the surnames mentioned above. Genetic genealogy research carried out by researchers at the University of Strathclyde has revealed exciting new information about the origins of one of the longest established noble English families. They may have been here longer than anyone had imagined. The Berkeley family, which has held the titles of Marquess of Berkeley, Earl of Berkeley and Baron Berkeley and still own Berkeley Castle in Gloucestershire, have been established in that County since before the Norman Conquest of 1066. They are generally recognised as one of only a handful of families who can reliably trace their ancestry back through the male line to before 1066. Their earliest known ancestor was Eadnoth, who served as a Royal official to King Edward the Confessor and King Harold in the years leading up to the Battle of Hastings. Eadnoth’s grandson Robert Fitzharding was granted the Barony of Berkeley and his son Maurice married one of the Berkeley family, whose surname he took on. Eadnoth was an Anglo-Saxon noble, but DNA testing of male line descendants of the family shows that their origins may date back even further to an ancestor belonging to a genetic group which arrived in England before the Anglo-Saxons, who only began to settle from the middle of the 5th century. The male line ancestor of Eadnoth belonged to a people who appear to have travelled over time from southern to northern Spain with some eventually arriving in Britain either before or during the Roman period. Perhaps the ancestor from this same genetic group might have been a Roman soldier, recruited in Spain, who settled in Britain during the Roman occupation (1st-5th century). Either scenario would suggest that Eadnoth’s ancestor had settled in Britain before the Anglo-Saxon era. With the subsequent dominance of Anglo-Saxon culture, it would be inevitable that over time the family would adopt Anglo-Saxon names and become assimilated into the Anglo-Saxon culture. The family maintained its status from the end of the Anglo-Saxon period into the Norman period, a very unusual occurrence, but may also have held this position from an even earlier Roman or pre-Roman period. Is this perhaps an example of the longest period of noble status maintained in the male line by one family? The genetic genealogy research was carried out by researchers from the Genealogical Studies Postgraduate Programme at the University of Strathclyde in Glasgow, originally in connection with their Battle of Bannockburn Family History Project, since a number of the Berkeley family took part in the Battle in 1314. Genetic genealogy – what is it and how does it work? What is genetic genealogy? – Genetic genealogy uses traditional documentary evidence and DNA results from individuals who are alive today. As our DNA preserves a record of some of our ancestors, the degree of relatedness between different individuals can be established through testing. Why use genetic genealogy? – Genetic genealogy can help individuals answer questions which cannot otherwise be answered due to a lack of documentary evidence. It also enables each of us to potentially connect to individuals who have a verified documentary descent from historic individuals such as the men who fought at Bannockburn. Y-chromosome testing – Only men carry a Y-chromosome and as surnames typically follow the paternal line, Y-DNA can be used to establish whether men share a common male ancestor. How does it work? – Cells are collected from the mouth by means of a swab. DNA is extracted, ready for processing and analysis. The results of the analysis are then compared to those from other individuals. The degree of relatedness can be calculated to predict how long ago two individuals shared their most recent common ancestor. STR markers and SNP markers – We use two different types of DNA markers in genetic genealogy research. STRs (short tandem repeats) measure the number of times a sequence of genetic code is repeated at a specific location on the Y-chromosome. Common tests available are on 37, 67 or 111 markers. As the values for these markers change over time they are useful for establishing the time frame when two men shared a common paternal ancestor. This is the type of test recommended for establishing connections in the last 400 to 500 years. SNPs (single nucleotide polymorphisms) are markers which have a slow mutation rate and tests on these can therefore be used to identify different branches of male line descendants and to confirm links from more than 500 years ago. How can you get involved? – Any male can take a Y-DNA test to investigate their paternal ancestry. We would recommend taking either a 37 or 67 marker test and to join your relevant clan, family or surname project hosted at Family Tree DNA or other provider. If you are female, you need to get a male relative such as a father, brother, uncle or nephew who bears the surname to take a Y-DNA test on your behalf, though other DNA tests are available to women.